Dr. Peter Weidinger (Director Materials Laboratories Brose Group) between Manuela Weiß (left) and Dr. Roman Schöldgen (right), the two winners of the Brose Award. 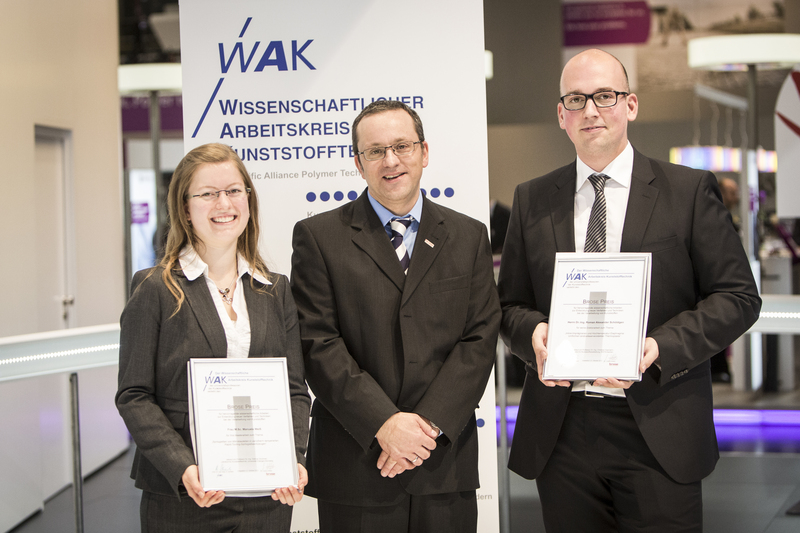 International automotive supplier Brose and the Scientific Alliance of Polymer Technology (WAK) presented the Brose Award for excellent research on developing new methods and technologies for plastics processing during the "K 2013" in Düsseldorf. The mechatronics specialist recognized the achievements of two scientists: Manuela Weiß for her master's thesis at the Institute of Polymer Technology of Friedrich-Alexander University Erlangen-Nürnberg and Dr.-Ing. Roman Schöldgen, Deputy Director of the Institute of Plastics Processing (IKV) in Industry and Skilled Crafts at RWTH Aachen University, for his dissertation. "Polymers are an increasingly vital component in all of our product groups – in vehicle doors, liftgates and trunk lids, in cooling fan modules, in lightweight seat pans and in the rear seat bench," said Peter Weidinger, Director Materials Laboratories Brose Group when presenting the cash prizes worth a total of €9,000. "In sponsoring the prize, we want to honor the work of the WAK specialists and up-and-coming engineers. While mechanical engineer and prize winner Manuela Weiß wrote her thesis on injection molding of microparts in variothermal temperature controlled rapid tooling systems, Dr. Ing. Roman Schöldgen's dissertation dealt with "Inline-Impregnation and High-Temperature-Diaphragm-Forming of continuous Fibre Reinforced Thermoplastics". "With this award we want to highlight the fact that engineers can be very creative, especially in plastics engineering, because the material offers lots of scope for design and potential applications," explained Dr. Weidinger and added: "We also want to send out the message that specialists like today's prize winners can find exciting jobs at Brose." The Scientific Alliance of Polymer Technology awards prizes each year to six researchers in three different subject areas. Their work is evaluated by renowned national and international professors of the WAK. There is a prize sponsor for each subject and this is the seventh year that the Brose Group has sponsored a prize.